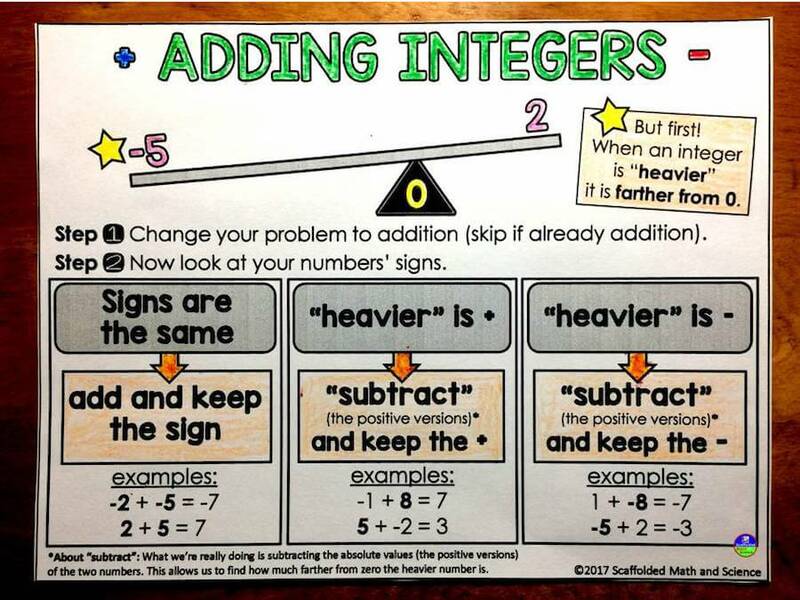 Operations with integers is such an important concept for students to master. While integers are used often in everyday life, adding and subtracting integers can be a challenge for students. When I teach a tough topic, I try to collect as many different ideas as I can, so that I have lots of options if my students start to struggle. Having lots of ideas for teaching integers can help keep things fresh for you too! What is an Integer? - This is a well-done video by kids. They give lots of explanations with diagrams too. Where's the Third Wheel? or Introduction to Positive and Negative Numbers - This blog post explains how to use counters to make zero pairs. 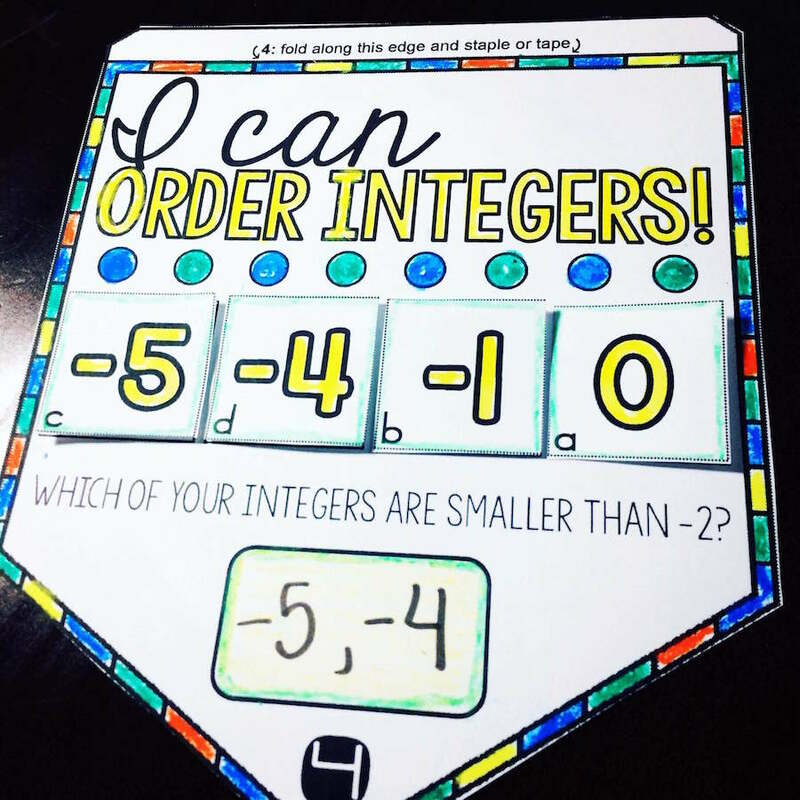 Ordering Integers Math Pennant Activity - This activity is a great way for students to practice ordering integers and it makes a cute classroom display. Discuss Integers in Their Natural Habitat - Students have encountered integers in their daily lives. Have students list as many different real-life examples of integers as they can. Checking accounts, the stock market, basement floors in a building, temperatures, there are so many integers in real life! Integers Song: Learning About Positive or Negative Whole Numbers - This song is a little cheesy, but it gives lots of real-life applications for integers. It's two minutes well spent. Integers Song: With Introduction to Absolute Value - This is a cute little video by Numberock. 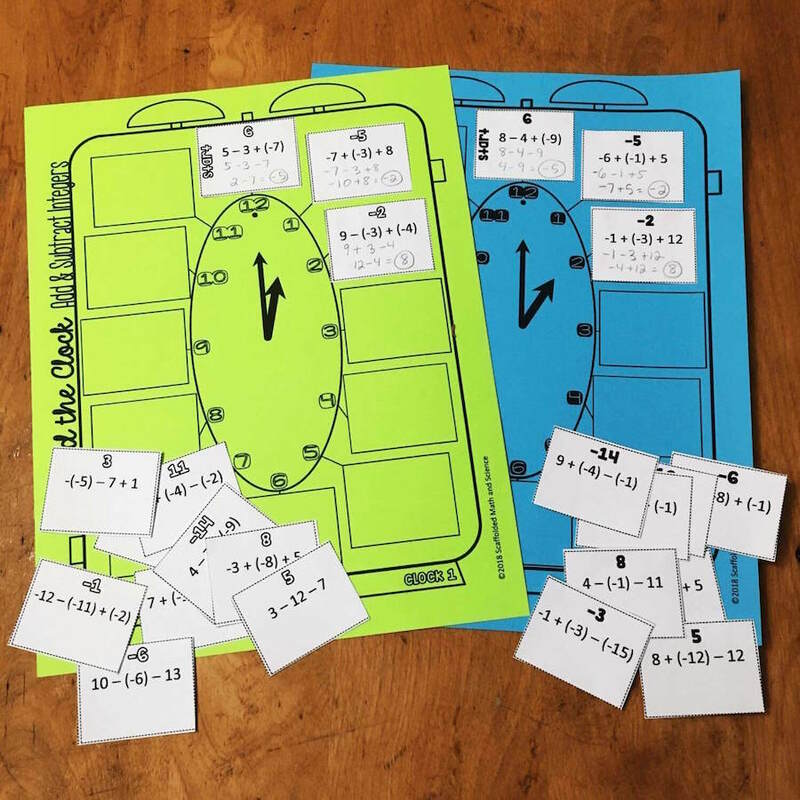 Adding and Subtracting Rational Numbers Foldable - This foldable and practice sheet is great for helping students organize information about adding and subtracting rational numbers. Teaching Adding and Subtracting Integers - Tile spacers are a great manipulative to help students make zero pairs. This blog post explains how to help students understand the concept. 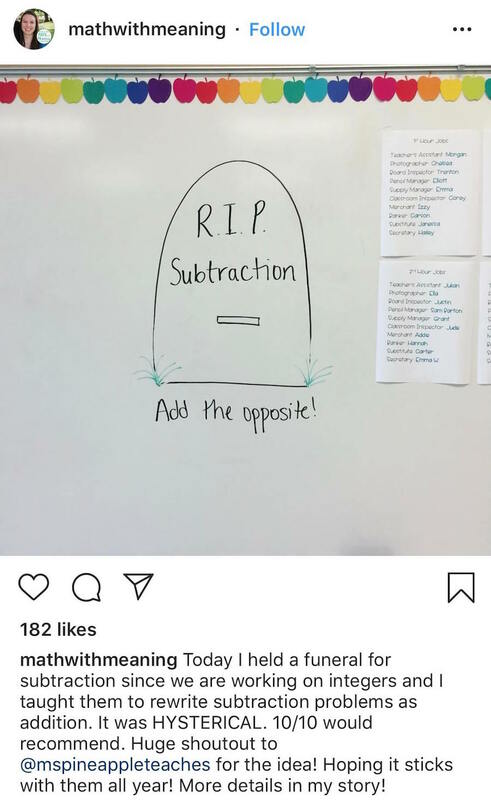 Have a Funeral for Subtraction - Subtraction of integers, by definition, is adding the opposite. @mathwithmeaning had a funeral for subtraction and had her students rewrite subtraction problems as addition. Having students write their own problems could get funny! Integers: Addition and Subtraction Square Puzzle - This square puzzle is a fun way to have students practice. I like to use it as a warmup or as an activity for centers. 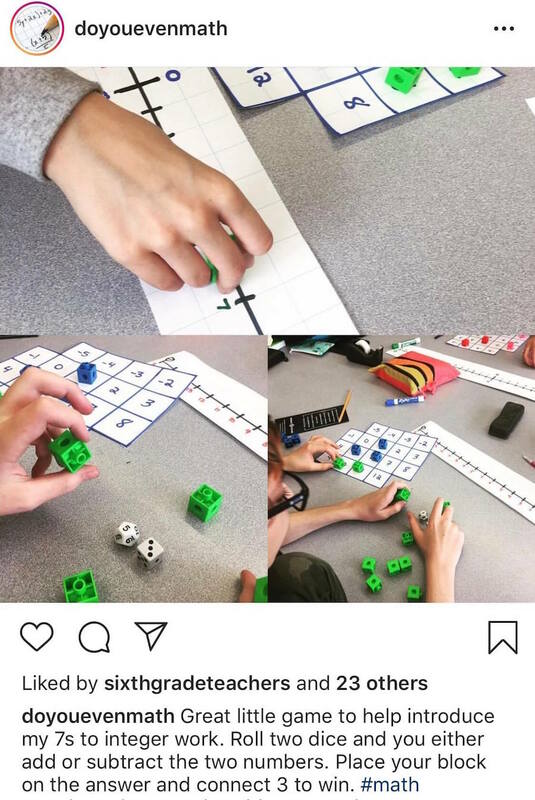 I featured it on my instagram account @mrseteachesmath. Use Money Examples - Integers can feel like an abstract concept for some kids. However, if you explain adding and subtracting integers using money, it can help! For example, "Johnny owes me $5. He paid me $3. How much does he still owe me?" 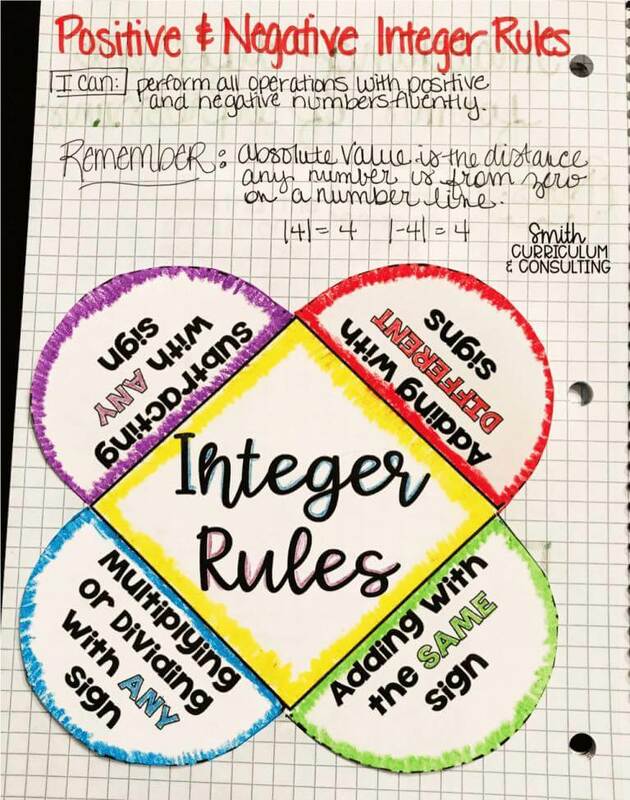 Integer Operations Graphic Organizer - This free graphic organizer is an awesome visual for students to "see" the rules for adding and subtracting integers. It would be great in an interactive notebook too! 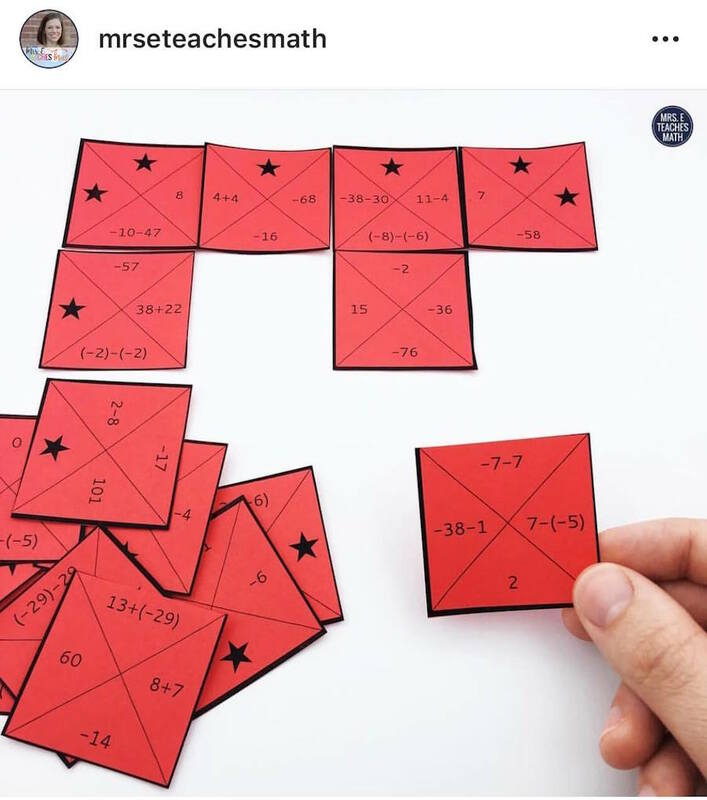 Adding Integers Square Dance Match Game - This free puzzle is a fun way for students to practice adding integers. 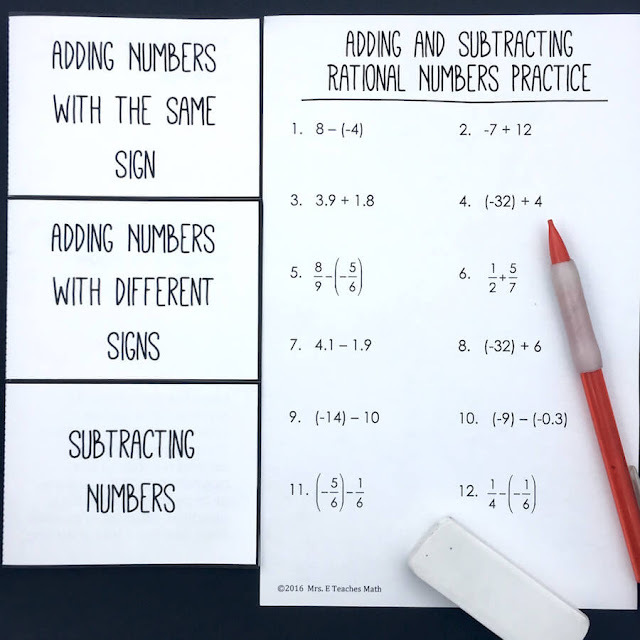 Adding and Subtracting Rational Numbers Mini Unit - These interactive notebook pages are a great way for students to take notes while learning about integers. Have Students Write a Comic Strip - Sometimes students just need to let loose a little. Writing a comic strip can be a fun way to demonstrate their understanding! @thesmartpug has an adorable comic strip! 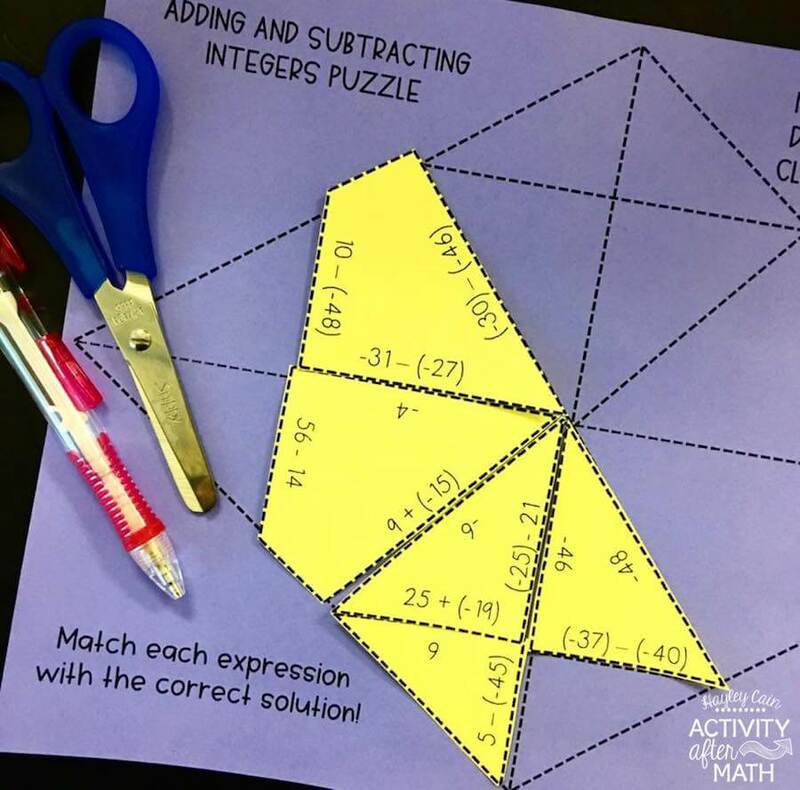 Adding and Subtracting Integers Puzzle - If you're in the mood to break out the scissors and glue, this cut and paste puzzle is a great way for students to practice. Adding and Subtracting Integers - If you want to use snap cubes to help your students with addition and subtraction of integers, but you're unsure how to introduce them, this video is perfect. 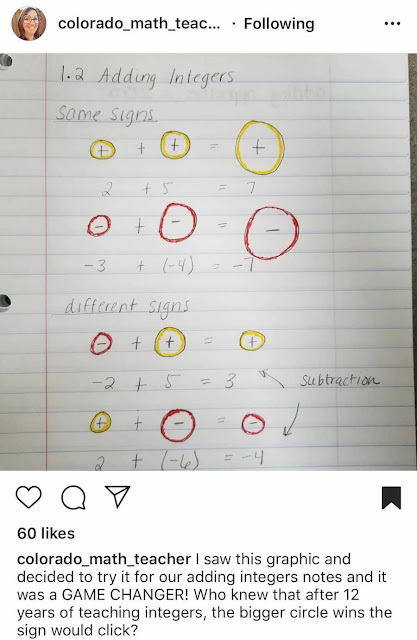 Here, a teacher explains how to use them to teach your students. 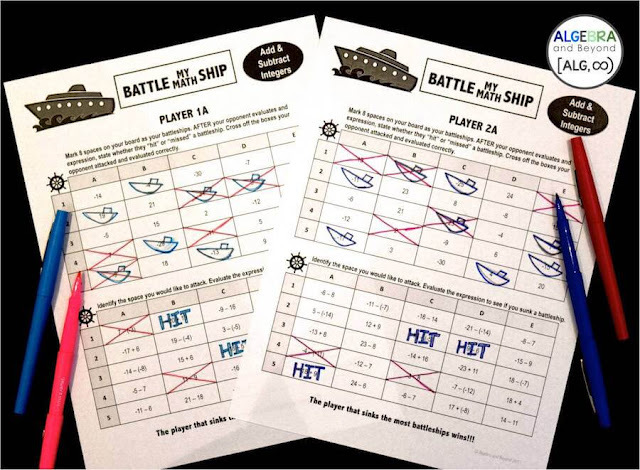 Integer Operations Battle My Math Ship Activity - In this partner game, students play Battleship. This would be a fun sub day activity! A Manipulative for Integer Operations - This blog post explains how to use a number line to help students decide the sign of the answer when adding and subtracting integers. Use Snap Cubes to Play Games - @doyouevenmath played a fun game with snap cubes to practice integers. 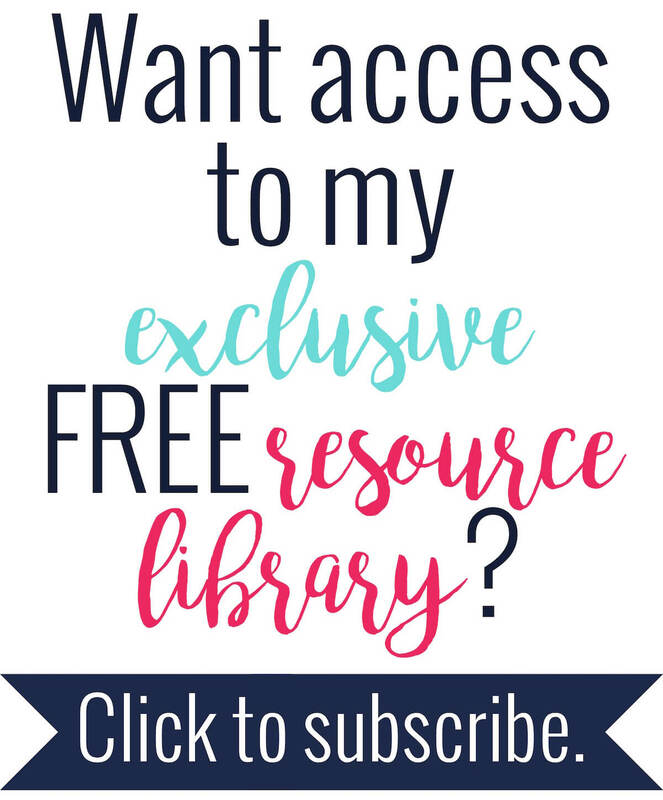 Math Antics - Adding and Subtracting Integers - If you will be having a substitute or use a flipped classroom, this video lesson is a good option! Adding and Subtracting Integers Partner Scavenger Hunt - This cut and paste partner activity is a fun way for students to practice, with a twist. Integer Rules Visuals - Sometimes kids need to SEE which number is bigger in order to choose the correct sign when adding and subtracting. This blog post gives a great visual. @colorado_math_teacher used this same technique to write notes for her students. 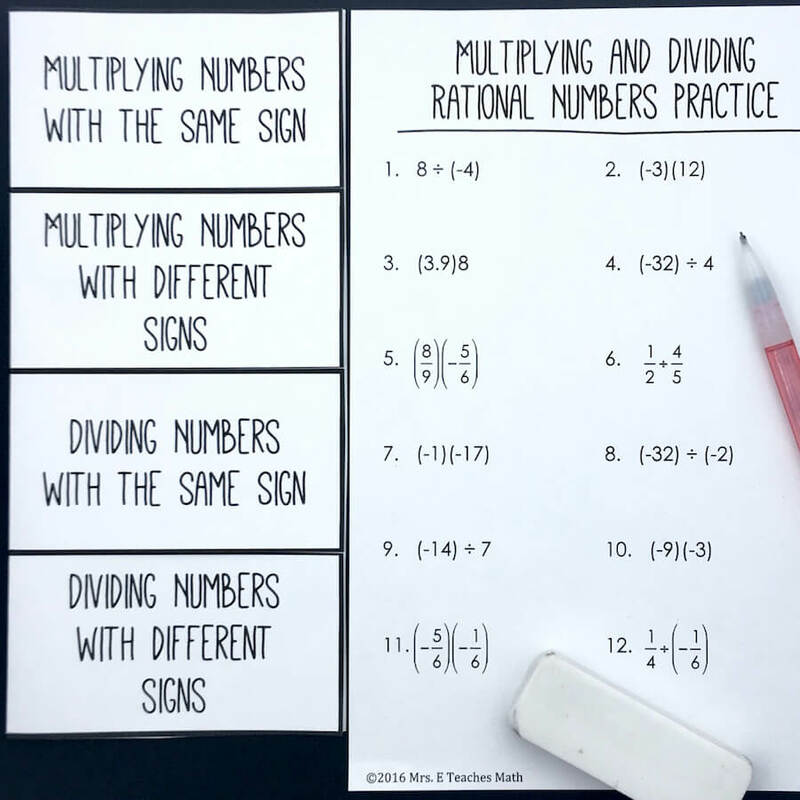 Multiplying and Dividing Rational Numbers Foldable - This foldable and practice sheet is great for helping students organize information about multiplying and dividing rational numbers. Negative Number Multiplication Bingo - This is a math bingo game that involves multiplying and dividing negative numbers. Multiplying Negative Numbers by Negative Numbers Animation - This is a simple number line animation that helps explain multiplying two negative numbers. It reinforces a pattern. 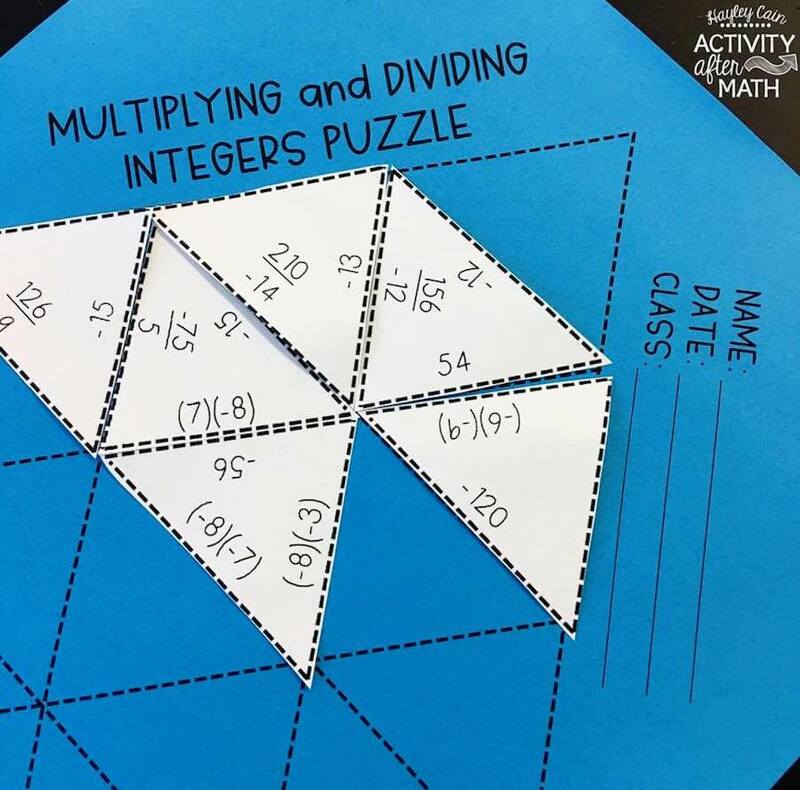 Multiplying and Dividing Integers Puzzle - This is a great activity to use in stations, as a small group activity, or as an individual activity! Multiplying and Dividing Rational Numbers Foldable - These two lessons are great in an interactive notebook! Positive and Negative Integer Rules Lesson for INBs - I love this interactive notebook page as a review for positive and negative numbers! It's pretty and can easily be adapted for all skill levels. 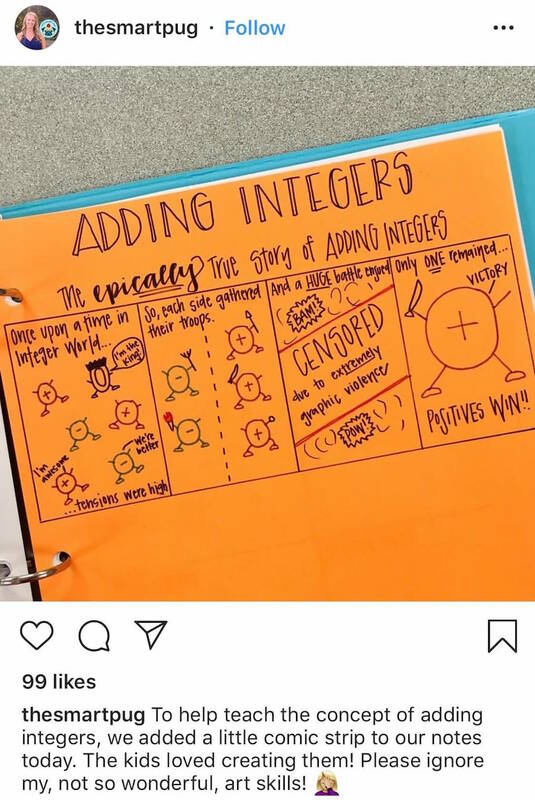 Operations with Integers Differentiated Notes and Practice - If interactive notebooks aren't your thing, this complete lesson is perfect. I love when things are already differentiated for me! Integer War - Have students play War, but instead of playing one against one, they play in teams of two. 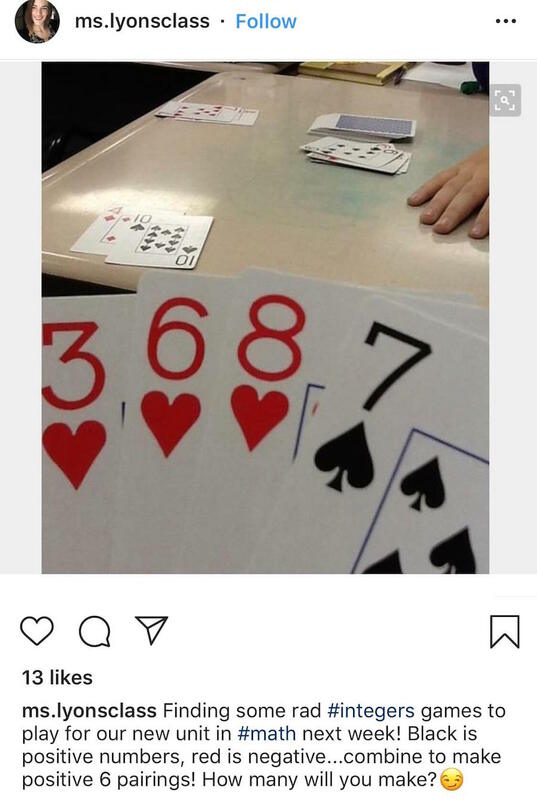 Instead of the biggest individual card winning, the largest team sum wins. You could also change this to be subtraction, multiplication, or division. Red cards are negative, black cards are positive, and you can choose the numerical value of the face cards. @ms.lyonsclass enjoyed playing too! Magical Math Solve and Color - This unicorn is adorable! 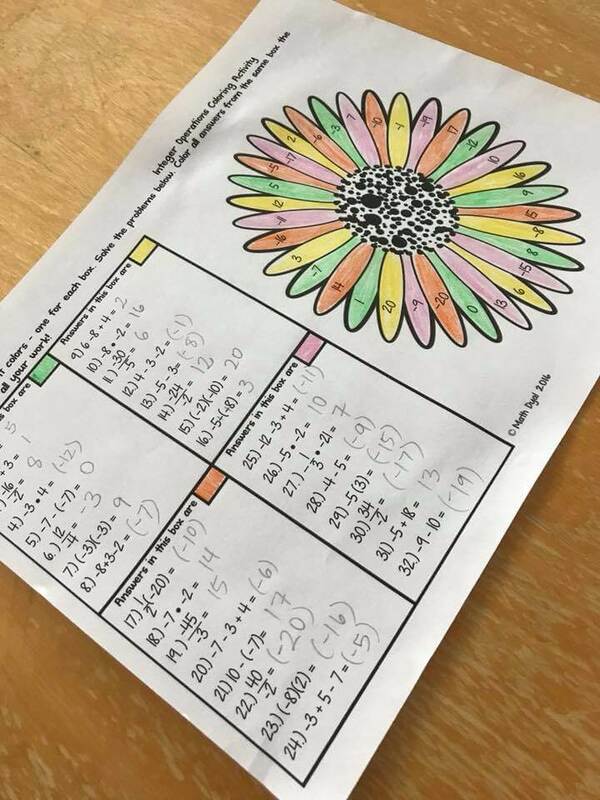 Students can practice integer operations while coloring a picture. Reviewing Integers - This blog post is a great explanation of how to effectively review integers with students that have a basic understanding. Integer Operations Solve and Snip Interactive Word Problems - On this worksheet students will show their work and cut out the correct answer. Integer War - Order of Operations - This fun game combines the game of War with the order of operations. 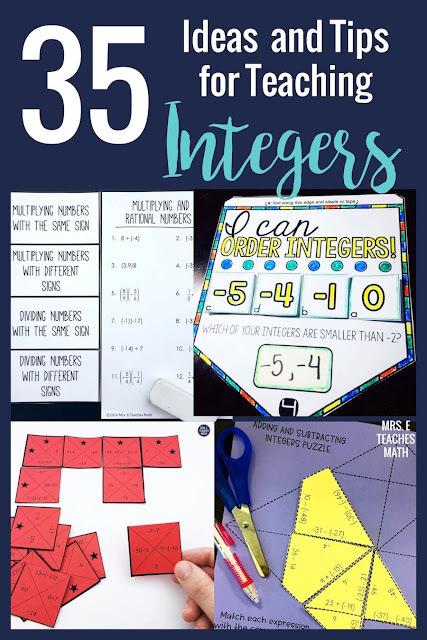 I hope you've found some awesome ideas to help you teach your next unit on integers!